VĨNH PHÚC — One female passenger was killed and five others were injured early Monday morning when their coach collided with a truck travelling on the Nội Bài-Lào Cai Expressway in the province’s Lập Thạch District. The two vehicles were reported to be travelling in the same direction from Hà Nội to Lào Cai. 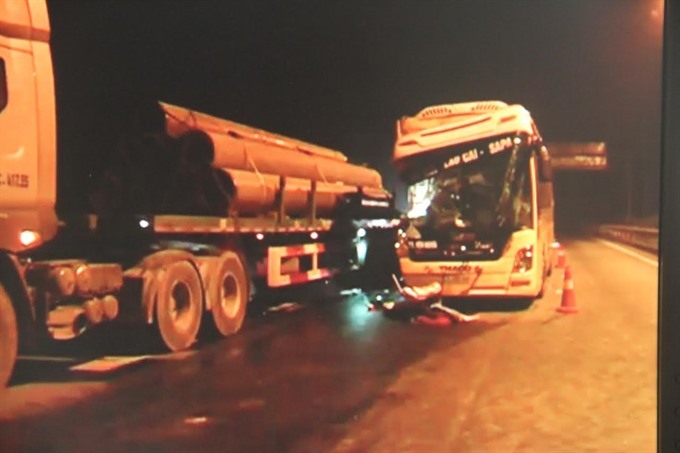 Of the six victims, two are assistants of the coach driver. The injured victims are being treated at Phú Thọ Province General Hospital and Vĩnh Phúc Province General Hospital. Nguyễn Văn Huy, head of the Emergency Department at Phú Thọ hospital, said the department received two victims -- one victim was recovering from a thigh surgery while the other with slight facial injuries would be discharged from hospital shortly.